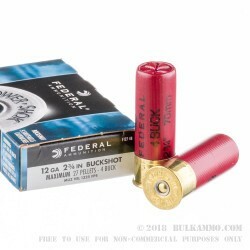 A great bulk discount exists for this very straightforward, no-nonsense buckshot round made by Federal. 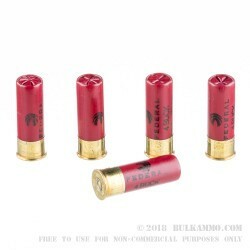 The 2 ¾” shell houses a 27 pellet cup of #4 buck for hunting and defensive purposes. This shotgun load is particularly well suited to medium game and predator animals, but can also effectively be used for home defense scenarios. 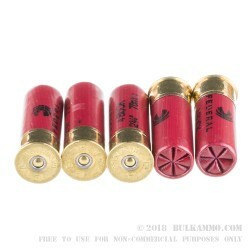 It should be noted the densely contained spread of this round (and similarly loaded #4 buck loads) does have some risk of overpenetration, and for use as a personal defense round, it is best suited for large homes with large areas, or for rural properties where there is additional space to engage a threat. It is also best suited for predatory animals and mediums sized game, though it can be brutally effective on small game at longer ranges. The pellet payload can deliver a nice compact pattern of lead on target out well past 20 yards, and even up to around 50+ yards given the right barrels, chokes and conditions. The relative power of this round and the high base makes it very well suited to semi auto shotguns as well. 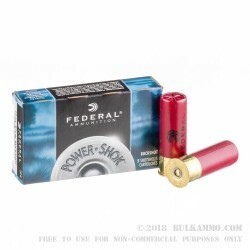 This round is suitable for use in any 2 ¾” chambered shotgun n 12 gauge.